Hotel Rauðaskriða is a family run hotel, located at road 85 between Húsavik and Akureyri. We are located in a rural area and are good base for natural attractions in North East Iceland like Goðafoss waterfall, Lake Mývatn, Dettifoss waterfall, Dimmuborgir lavafield, Whale Watching in Húsavík, Ásbyrgi Canyon and Akureyri. Hotel Rauðaskriða was founded in 1990 by Haralds parents, Kolbrún and Jóhannes. For the first year it was only two rooms in their home. In 1991 the 2nd floor on the main building was added and gradually more and more rooms have been added and the restaurant expanded. In 2012 there was a generation change in this family business, when we Harald, Begga and our kids, Ragnar (25), Katrín (18) and Hulda (13) took over the hotel. We have two cats, Gríma and Krummi (e. raven), and one bunny, Lúlli Van Beethoven. We also have two horses. We have always been very environmental minded and that´s probably one of the natural thing when one is raised in the countryside in close encounter with nature and knows how delicate it is and how important for us all. For this purpose Haralds parents started to focus on getting recognition for the hotel as environmental friendly. In 2011 we got our first certification from the Nordic Swan Association (Nordic Eco-label) and Hotel Rauðaskriða was the only hotel in Iceland which had this recognition. Today there are much more, and it´s a good thing more and more are taking responsible steps in this direction. 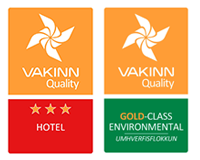 Hotel Rauðaskriða is certified as a three star hotel by the Icelandic official quality system called Vakinn and was the first hotel in Iceland to receive this recognition. Hotel Rauðaskriða also holds a Environmental Gold Certification by “Vakinn”. Being located in the countryside and a farm we are part of Icelandic Farm Holidays which offers accommodation in farms around Iceland. We have received two awards from this association. 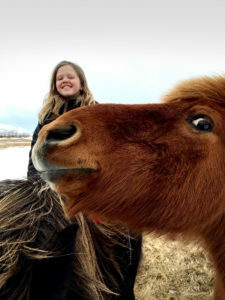 In 2012 Icelandic Farm holidays started to award “Farm of the month”. This is awarded to farms who supply excellent service both to guests and Icelandic Farm holidays. Hotel Rauðaskriða was the first farm to receive such an award. In 2013 we also received the “Encouragement Award” from Icelandic Farm Holidays for our wildlife tours. We offer divers guided tours in our area for wildlife (f.i. whale watching and bird watching) this can be found on the internet www.wildlifeiceland.is. Today we can accommodate 80-90 guests and have à la carte restaurant. We plan to keep on being a family business giving personal service and caring for our environment.